It is that time of year again- white denim season (I know I am breaking the ‘Memorial Day rule’ but fashion rules don’t exist in my book)! When I am in my ‘I hate everything in my closet and just need an easy outfit’ mood I typically pull out my favorite pair of white skinny jeans and throw on an easy striped top and comfortable flats. If I am feeling fancy I will add a hat, maybe a light jacket and a chic tote. You can shop my exact look below as well as staples to re-create it under $100 (just click the below images to shop away). Denim: Jbrand (these are my favorite and can be hard to find! I love them for the slightly higher rise, cropped length and thick denim that is oh-so-important when it comes to buying white bottoms. I also just got these, which are incredible). Trench: Khaite (very similar under $60 here). Bag: Nordstrom (seen like 100 times already this season). Flats: Pretty Ballerinas. Top: Zara (last season, but this one is amazing). Sunglasses: Celine. In love with your preppy white denim look! Thanks for the white denim suggestions! I’m currently on a hunt for new ones. For sure checking out your recommendations! Love this look so much! Classic and timeless pieces, the flats add the perfect touch. Thanks for sharing Blair. That trench jacket is beautiful! An easy clean , and fresh Spring look . I love the anchor detailed flats . Nautical theme items are always on point for summer! Looking great! So preppy chic! 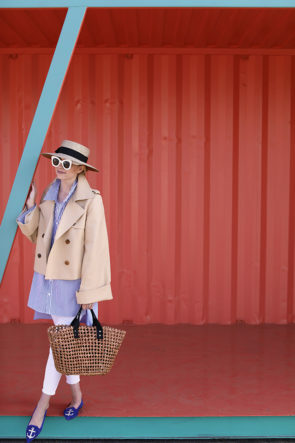 LOVE your shoes and trench! I’ve been thinking about buying that tote. It looks so cute on! You so pull off the preppy look! I love your style! I love this simple chic look! And I also wear white denim all year. 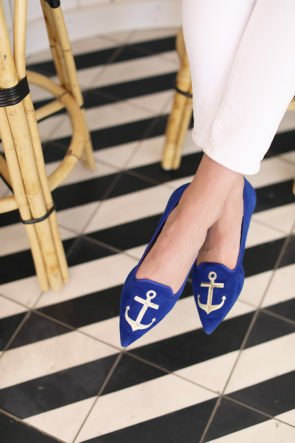 Absolutely adore your nautical shoes! All this look is stunning. Your flat shoes are a dream and your sunnies are awesome! I love this style ! I am a great fan of white denim for spring and summer ! I love this look! Your jacket is so fabulous, I really like how you paired it with the blue button up top and white skinny denim. Can I also just say, your shoes are amazing! very nice and looking gorgeous . White denim suggestion is so nice.Thanks for the sharing.I love you all look. Excellent dress varieties. Classic collection.